I’ve been working in digital pretty much since digital became a thing in the early 90s. At that point, the internet and associated new technologies were only being used by the cutting-edge trendsetters and super nerdy IT folks. Now, every company is using some form of technology in their business and the internet is pervasive. What is it going to be like to manage these in addition to the three other generations you’ve already got? Alan Lepofsky is the VP and Principal Analyst at Constellation Research, which focuses on collaboration and helping companies improve the way work gets done. Jeanne Meister is a Partner at Future Workplace, a firm dedicated to rethinking, reimagining, and reinventing the workplace. Steven ZoBell is the Chief Product & Technology Officer at Workfront, a pioneer in work management software (and a partner of Convince & Convert). Together on Tuesday, June 27th at 12pm ET/9am PT, they will present a compelling webinar that, frankly, anyone who works anywhere can benefit from, but especially managers the employ a wide range of people. From baby boomers to robots and everyone in between, this webinar will clear up the facts related to each generation that’s involved in our growing workforce today and answer a few really important questions that are on everyone’s mind as technology booms. 1. Is Artificial Intelligence Coming For My Job? You’ve seen the sci-fi movies where the humans create the robots to help them out and then the robots become too intelligent, rebel against their creators, and then someone like Arnold has to save the day. The creation of artificial intelligence and its prevalence today has got many workers worried that they’ll be replaced. But we always need to remember that automation has been happening for decades, even centuries. People are always trying to find ways to make work more efficient. And sometimes that means automating or using artificial intelligence to take tasks and make them happen more quickly. Now, we all hope that the growing automation and adoption of AI will only help us do our jobs better, not take them away, but some of us will need to worry about whether we’ll get outpaced and outnumbered by AI and automation activities. If that’s the case, the next point may be your saving grace. 2. What Skills Do I Need to Thrive? New generations have a very different level of comfort when it comes to adopting and utilizing new technologies to help them get things done. A Millennial or Gen Z-er might have an easy time picking up an iPhone whereas a Baby Boomer may still have trouble figuring out a keyboard shortcut. Still, however, evolution is happening and every time a new piece of technology enters the marketplace, employees need to figure out how to adopt it. The new skill set required to thrive in an ever-growing, ever-changing economy isn’t something that only new workers need to adopt. Even the older professionals will need to adapt or be pushed out. 3. What Will the Future of Work Look Like? A famous trait of millennials these days is their need for independence at work. They want to work from home, they want to work flexible hours, and they want to learn new skills to help propel their careers. Many businesses have evolved as a result, and smartly, in my opinion, because you can’t stop change. You must embrace it. And as a manager, it’s your job to understand the needs of your team, figure out which ones benefit the company, and advocate for them to the powers that be. Now, this is an ongoing process. People are special snowflakes and will always have different needs. Of course, you don’t need to play into all of them, but you need to be prepared with an understanding how to maximize these needs while still making sure your team is productive, focused, and ready to take on new challenges. 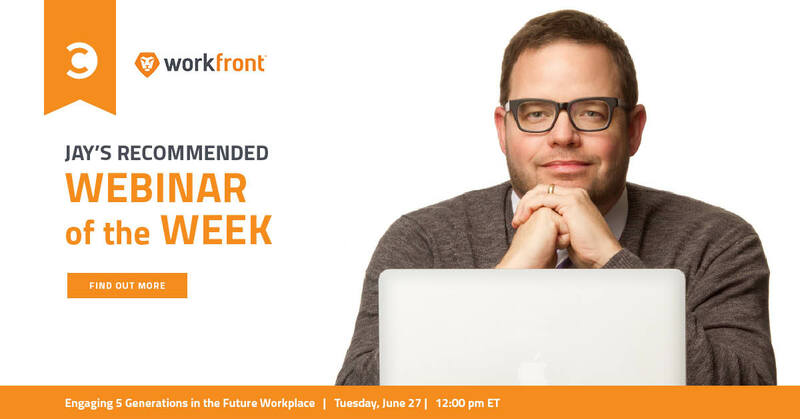 I hope you’ll join Workfront on June 27th for a rousing discussion on this incredibly relevant and interesting topic. I look forward to seeing you there!